The traditional clash against Ajax takes on additional significance this weekend as the teams will be playing for the opportunity to hold the all-important fourth spot on the ladder. The early Premier B leaders of Old Brighton, St Bernard’s (our last two opponents) and Old Scotch, have put a break on the rest of the competition and Ajax and Fitzroy want to maintain contact. Expect a willing contest as it always when these teams meet. Last year Ajax upset our Anzac Day party by winning at Brunswick Street Oval and the Mark Williams-coached side will be out to do it again. 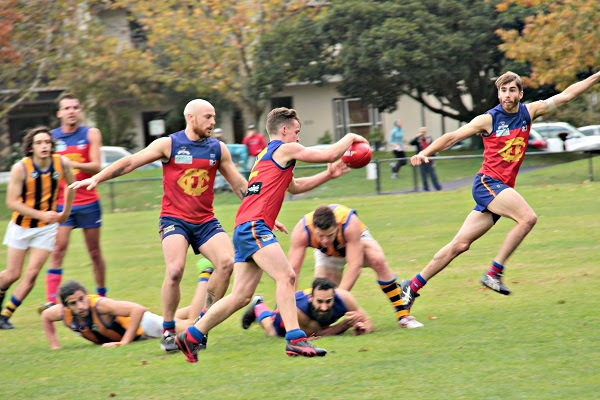 Fitzroy will need to move on quickly from last weekend – seven games and seven losses is not a feat we want to repeat! The Seniors will look to regain the form that saw them win the first two games. 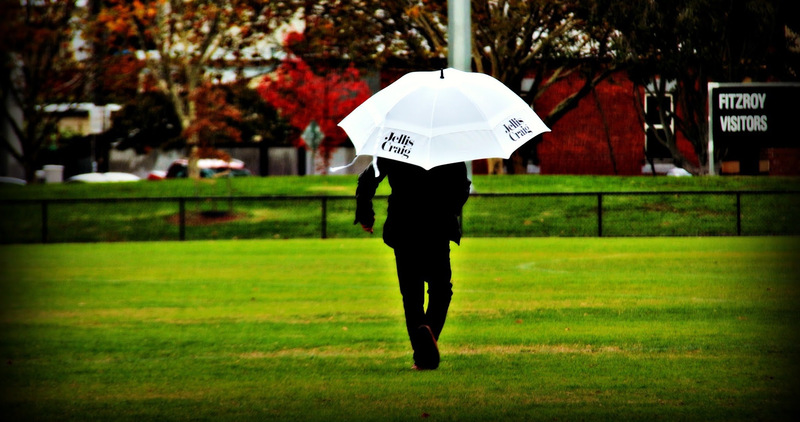 Speaking after Saturday’s rain soaked game, Coach Nick Mitchell said it was not the game he had wanted – with his old side, St Bernard’s, making their first visit to Brunswick Street Oval in sixty years a winning one – but they had deserved the win and their 4-0 start to the season. He also highlighted the youth in the Fitzroy team with 8 Under 19s/colts players in the side, indicating a bright future with a bit more experience under their belts. The Royal DerbyHotel best player was Captain Rory Angiolella, playing a different role requested by the coaches, while Aidan Lambert, who kicked a great final goal, was awarded the Pizza e_Vino voucher and Eddie Lincoln was given the one percenter award. The final score was 6.9.45 to 13.17.95. The Reserves also went down 4.13.37 to 11.14.80. The Fitzroy-ACU Women’s teams didn’t fare any better. It was the first defeat for the Women’s 1 team as they moved into the proper competition games of the Women’s Premier Division. Such is the standard of the competition that one win has seen them drop to 6th on the ladder. They were defeated by SKOB Saints 3.4.22 to 6.10.46, but had several senior players missing for the day. Playing their first game in Development Division 4, Fitzroy-ACU Women 2 fought hard against De La Salle and were right in it to half time, but just couldn’t get the goals on the board and went down 2.10.22 to 0.4.4. The Thirds also went down but are hanging onto fourth spot with a slightly better percentage than Old Trinity. Both Under 19 teams lost and are certainly struggling to maintain touch with the top of the ladder, no doubt affected by the success of their team mates’ graduation to Senior footy. 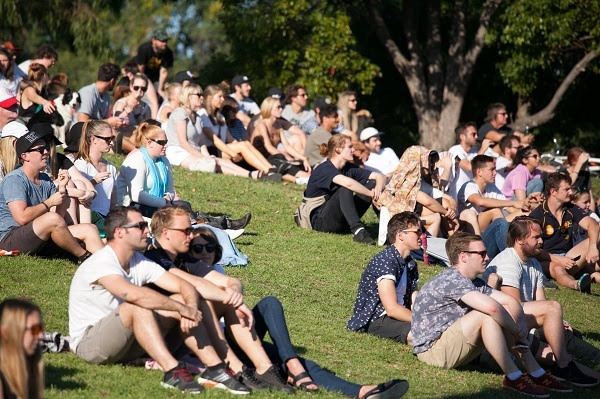 Saturday’s game – the second at home in two weeks – is the Jellis Craig Game and we’re encouraging all Fitzroy supporters to get down to the ground and enjoy the contest and great atmosphere at Brunswick Street Oval. Kerry’s barbecue was certainly popular in last week’s wet and cold conditions, but we’re expecting a fine 17 degrees on Saturday. Let’s get behind the boys as they take on Ajax. Jellis Craig Managing Directors, Craig Shearn and Rob Elsom said they are really looking forward to attending this week’s Jellis Craig Round with a number of their team members. “With Jellis Craig’s significant growth over the last 12 months in the Inner North, we see our ongoing commitment to supporting the local community (and in particular, an extremely well run and historical sporting organisation in Fitzroy Football Club), as a natural fit to engage and support the local community in which our clients live and work,” Craig said. years – you can see their logo on the back of our new jumpers - their commitment to this philosophy has also been further evidenced with their new five-year commitment to the Fitzroy Junior Football Club. Bernie Sheehy, the man who coached the Fitzroy Reserves in the mid 80s and Ajax from 2009-2012, will be the guest speaker for our pre-game lunch tomorrow before the two teams meet. It will also be a game for Fitzroy past players so come along and join in for some banter and good food as part of the Jellis Craig Game. There are still a few seats left so please book online as soon as possible . Book now for your ticket. What do you say to the volunteers who get out in the rain and the cold throughout winter to help us achieve our footy goals? A giant THANK YOU. We appreciate everything you do and we’d be lost without you. Looking for a career in sports media? Want experience working behind a bar or in food handling? Just looking to keep fit? Fitzroy can offer a wide range of volunteer roles and they might not just be the ones you’d expect. Having grown from four teams to seven in just over two years, there are plenty of opportunities to get involved. Register your interest today. 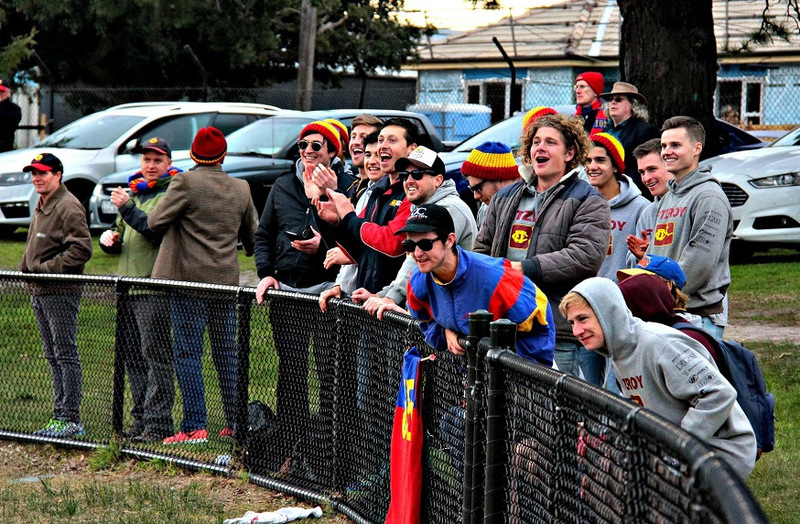 When the Thirds run out in Round 7, they are hoping for a large contingent of die-hard Fitzroy fans to cheer on one of their spiritual leaders in his 200th game. The boys are expecting a crowd of 200 or more as they focus on traditional fan football for their first Fan Day. Not to mention it's a celebration of one of their favourite sons, life member and 200-gamer, d-rock (aka Dan Ryan). Put Saturday 27 May down in your diary and consider heading to Ramsden Street Oval for a bit of old fashioned community footy. The action starts from 11 with the game at 11.40. Prime mover and Thirds social secretary, Keith Dimech said “What's the point of taking spectacular marks and kicking the impossible goal if no one is there to see you do it? Keith says the Thirds are embodiment of community and inclusion at Fitzroy and they are keen to show off the bond they have at Ramsden Street. the traditional trip out onto the ground at the quarter breaks to hear the coach's message and a kick on ground after the final siren. After the game there will be enough time to get back to Brunswick Street for the second half of the Seniors’ game, as they also take on Monash, and the post-match celebrations which promise to be big. 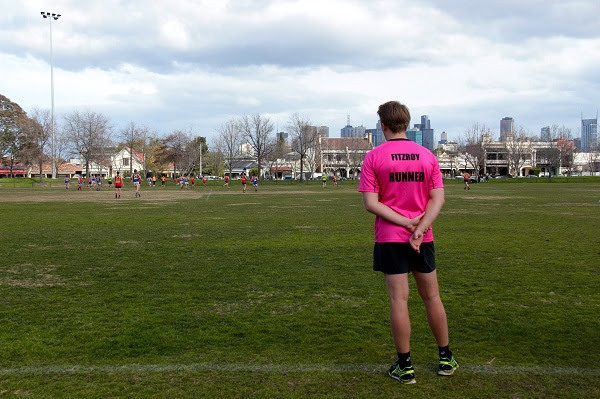 One of the up and coming brigade of Fitzroy Under 19 graduates, Isaac Wattis, will play his 50th Fitzroy and VAFA game this weekend when the team lines up against Ajax. Isaac is pictured front right at the recent preseason camp at Portsea. What do you think of our events on game day? Are there things we could do to improve our memberships? These and other questions are part of a survey the Holmesglen Sports Media students are conducting, which closes today. Please spend just give minutes to provide some answers and you could go into the draw for a prize. 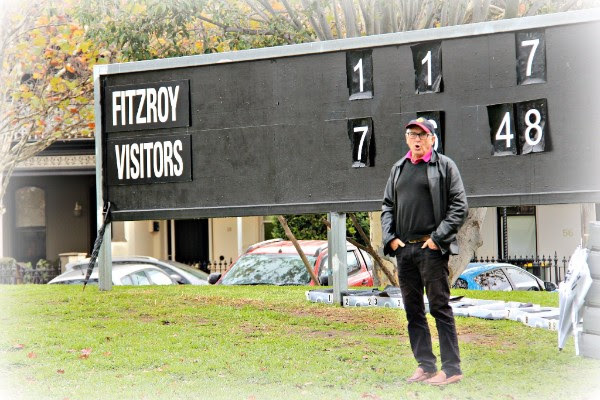 We would encourage all Fitzroy players, members, volunteers and fans to complete the short survey to make sure we capture a wide variety of opinions. Your feedback will provide the club with the opportunity to learn and grow, making Fitzroy an even greater club to be part off.